A pointed commentary that pulls no punches in its criticism of the habit of 18th century well-heeled Englishmen to dismiss their countrymen’s art in favor of Old Master paintings by continental European artists. This wonderful public airing of a personal feud is also a fascinating commentary on art and cultural prejudice. John Boydell, an esteemed engraver, printseller and member of the Royal Academy thought he could encourage the development of an English school of history painting by commissioning British artists to paint scenes from Shakespearean works which would be engraved and assembled in a published work. 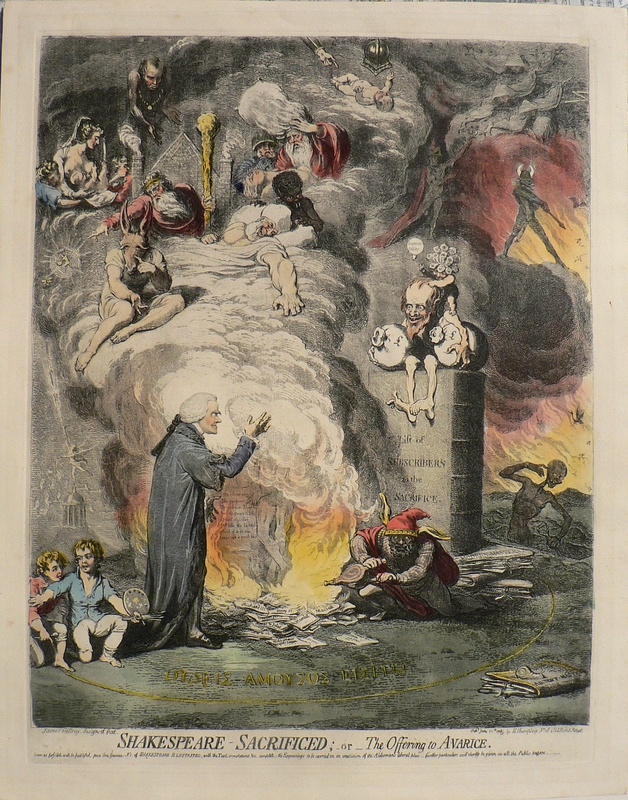 It is noted below the title that the anthology “Soon as possible will be published... further particulars will shortly be given in all the Public papers.” James Gillray was incensed that Boydell did not select him to create a painting for the series and he expressed his outrage and enacted his revenge in this engraving replete with symbolism. A full figure of the patrician Boydell stands before a burning pile of Shakespeare’s plays the flames fanned by a figure dressed in the costume including hat with donkey ears of a Shakespearean era fool. An unmistakable parody of Avarice clutching two bulging bags of money sits atop a massive monument marked “Gift of Subscribers to the Sacrifice.” It rests upon portfolios marked “Modern Masters.” In the lower left a figure of a young boy holding a painter’s palette and brushes holds back another boy holding the engraver’s tool, the buren. 21 5/8 x 17 ¼ inches. Excellent condition. Some residue of glue on the reverse but not visible on the face of the print.